Dr Sadashiv Moreshwar Ayachit was born in 1929. He obtained MA in Sanskrit/Pali in 1953 and PhD in Sanskrit/ Linguistics in 1959 from the University of Poona, Pune. India. He has had a distinguished professional career and he retired in 1987, after working for 23 years, as the Manuscripts Officer, Nagpur University, Nagpur, India. He distinguished himself by serving on several prestigious organizations, committees, and boards. He has several publications which include translation of Dr Panjabrao Deshmukh’s thesis into Marathi, titled Vaidik Sahityat Dharmacha Ugam ani Vikas”. He is presently working as Founder/Co-Director of itihas/Sanskrit Sanshodhan Kendra. Nagpur. Dr Ayachit was honored by the Maharashtra Government in 1997 and was specially felicitated by the Chief Minister of Maharashtra in 1999. The Asian Agri-History Foundation (AAHF), a non-profit Trust, was established and registered in 1994 to facilitate dissemination of information on agricultural history to promote research on sustainable agriculture in South and Southeast Asia region. This region had generally provided food security to its population for several millennia, with only occasional famines in a few limited pockets due primarily to drought. Farmers in the region had evolved some of the most sustainable agriculture management technologies suitable for different agroecoregions. There is a great deal to be learned from the traditional wisdom and the indigenous, lime-tested technologies that have sustained the farmers of South and Southeast Asia in the past. The historical perspective of gradual development of traditional technologies will provide clues for (i) understanding how farmers adjusted to changing environment in the past; and (ii) developing appropriate technologies leading to prosperous, sustainable agriculture. One of the major objectives of AAHF is to disseminate information on agriculture of the past by translations, with commentaries on the scientific content of texts. The aim of such commentaries by experts is to stimulate research to confirm, or otherwise, many old practices. 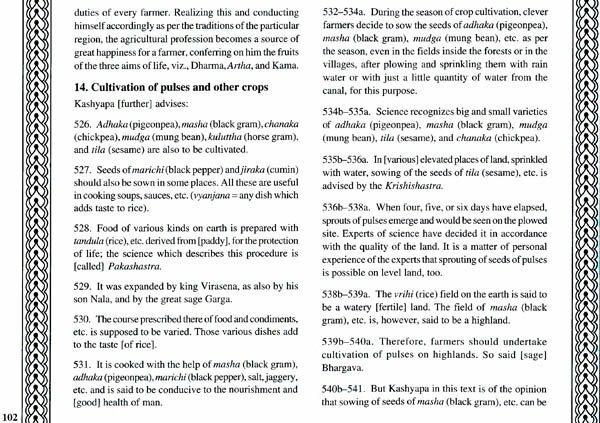 AAHF has so far published three bulletins: Vrikshayurveda (The Science of Plant Life) by a physician Surapala (c. 1000 AD), Krishi-Parashara (Agriculture by the sage Parashara) (e. V century AD), and Nuskha Dar Fanni-Falahat (The Art of Agriculture) (a manuscript written in Persian in c. 1650 AD) by Dara Shikoh, a Mughal prince. The translation of the Sanskrit text, Kashyapiyakrishisukti, was completed with dedicated efforts by Dr S M Ayachit, despite health problems. Dr Ayachit retired from Nagpur University, Nagpur, India and has been associated with the ltihas/Sanskrit Sanshodhan Kendra at Nagpur. He currently lives in Pune, India. Though Dr Ayachit wanted the use of International Phonetic Alphabet in English translation, we have not done it for various reasons. A copy of the manuscript (No. 38J8) in Devanagari script was obtained from the Adyar Library, Chennai, India. The copy was made by hand by Pandit V N Sastri and was checked together by Sri N P. Bhat and Pandit Sastri himself. A photocopy of the above was made available to the AAHF by Sri S K Chitale, who had obtained it from Sri R M Pujari. We are most grateful to all the above for their kind assistance. 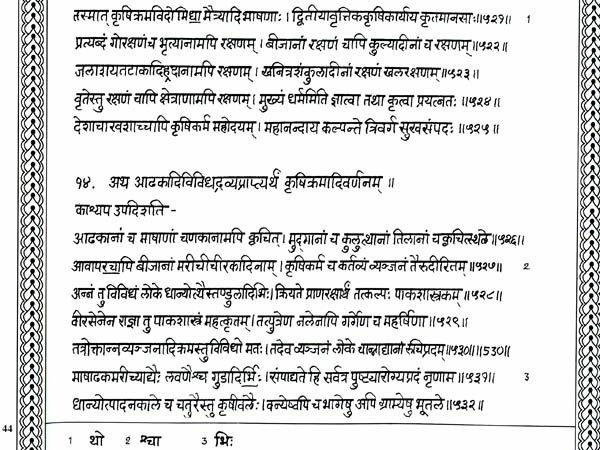 Dr Ayachit got another copy of this manuscript which was also used for this work (manuscript no. xxxviii-i-8; TR 871, 1930 AD). Kashyapiyakrishisukti was translated in English in 1985 by G Wojtilla and was published in Hungary. Thus the text by Kashyapa is not being translated for the first time. The AAHP undertook the present assignment because (i) Wojtilla’s translation is not easily available; and (ii) the translation was apparently not reviewed by an agricultural scientist Special gratitude is due to Dr (Ms) Nalini Sadhale, Professor of Sanskrit (retired) Hyderabad, India who reviewed the translation and wrote it in the present format. 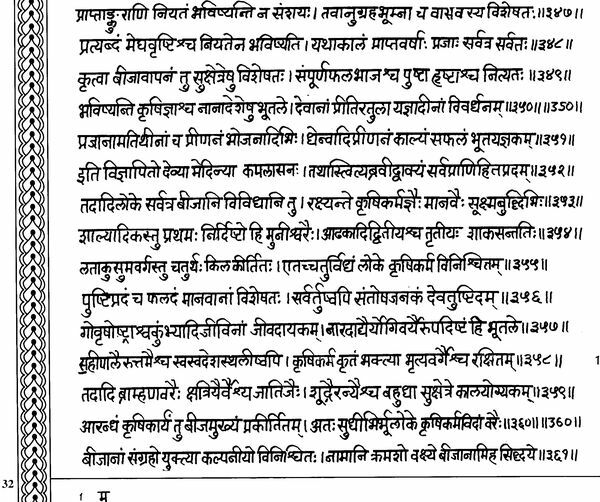 The Sanskrit text was rewritten by hand by Mr Prabhakar R Jogdand and commentaries have been written by Dr Sadhale and Dr Y L Nene. 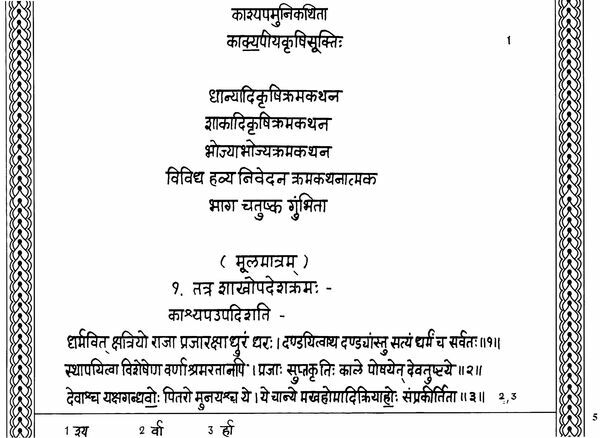 At the end of each verse in the Sanskrit text, the verse number has been indicated in Devanagari; however, to assist readers corresponding Arabic numerals have been given at every tenth verse throughout the text. Each verse has two lines considered as ‘a’ and ‘b and indicated so in the translation. For example, 10a is the first line of verse 10 and 10b is the second line. All the names of plant species appearing in the text have been listed in Appendix 1 prepared by Y L Nene. The AAHF acknowledges the contributions made by S M Sinha, Sheila Vijayakumar, S Lalitha Annapurna, K Anna Puma Devi, Sridhar Rao C. and P Nageswara Rao. in art work, designing, editing, typing, and formatting the bulletin. I had already intended to translate the text here being presented three decades ago when one of my friends had suggested procuring the manuscript for him to work upon. I was then in charge of the Manuscripts Department of Nagpur University, Nagpur, India and was in contact with concerned scholars. However the project was then somehow deferred. Therefore, when my young friend (now propagating research in Vidarbha’s history) Si-is K Chitale introduced me to the Asian Agri-History Foundation (AAHF) and opened up the project again, I gladly accepted it. He was responsible to request Dr Y L Nene, Chairman, AAHF to again take up the topic which was sidetracked. I have no adequate expression to thank these two scholars for the loving care with which they have treated me all along. I was then attending the Indian History Congress session at Chennai, India, which enabled me to personally contact the Adyar Library in Chennai. I got a photocopy of a transcription from an original Tamil manuscript (TR-87 1-6341 9-XXXVIII-i-8). 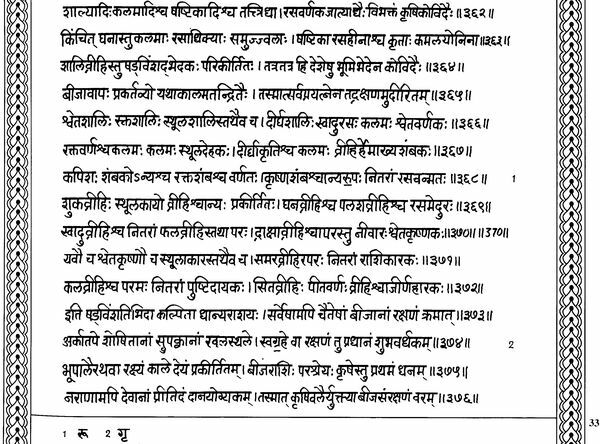 This consists of 113 folios of the text and 19 folios giving a fuller description of the contents, presumably prepared by the transcribers/copyist, who records at the end “Iti Shilashasanaparishodhakena panditen Vijayaraghavacharyen likhitam”. The copyist informs us that he was working as an epigraphist to the government, and that he completed the work at Tirupati on 19 December 1930. 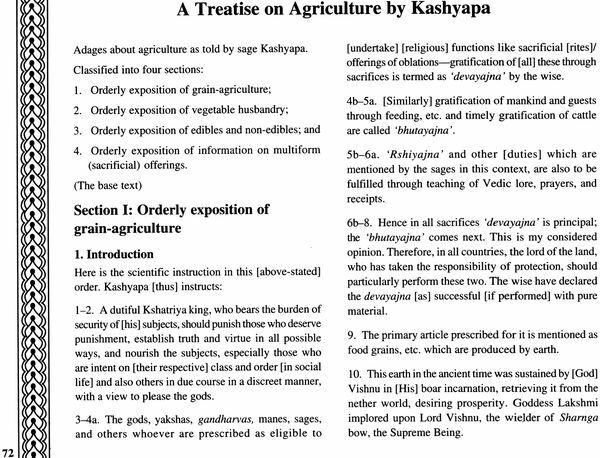 The title of the work is given as Kashyapamunikathita Kashyapiyakrishisukti”. The copy incorporates the base text. Verse numbers are not given. The copyist has done his job ably, neatly, and responsibly. He deserves credit for making this rare text available to us eliminating the textual difficulties as far as possible. In spite of a few vagaries of a southerner, his writing seems sufficiently reliable. No other copy of this work is known to rue. The fact of its publication/translation by a foreigner was made known to me only recently. Sri Chitale had handed over another transcribed copy of this work to Dr Nene, who got the text rewritten for printing it in this volume. 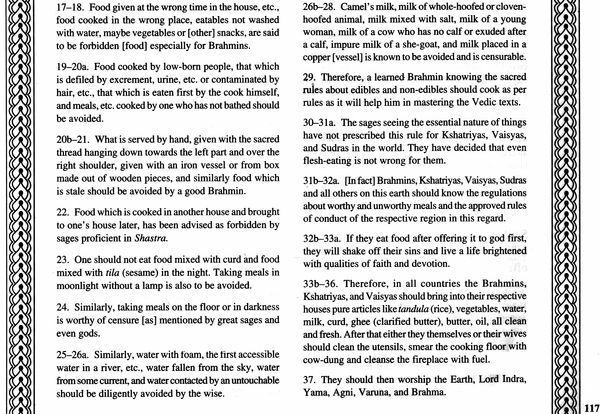 This copy belongs to Sri G G Joshi Pratisthan of Nagpur. It bears the transcript No. 3818. It was prepared by Pandit V N Sastri, who compared it with the original with the assistance of Sri N R Bhat. This copy contains verse numbers, which are followed in this volume (after few corrections). The numbering obviously seems to be the copyist’s work. This copy is much inferior in comparison with that described above. In a few places, the copyist could not correctly read the original words; he therefore wrote them wrongly, and also left lacunae (which now could easily be filled up). I had completed the translation in Nagpur and finally submitted it to Dr Nene on 7 June 1999. Our correspondence started in December 1996. For a number of reasons, the translation work lingered on, for which I am wholly responsible, in order to overcome some sentential difficulties, I had planned to group the matter under sub-headings, because the text did not lend itself to the desired succinctness. I also followed the International Phonetic Script, which has come to stay in research publications. However, I could not find time to recast my analytical rendering. I am extremely glad to find the translation now in a different format, ably done by Dr Nalini Sadhale, though of course my agreement to this presentation is not complete. I am heartily grateful to her for sincere and scholarly work, as also to Dr Nene for his constant supervision over the whole project. Since I was not involved in this later technical procedure, carried out far away from my place, I could only correct and improve the final proofs, which were otherwise perfect. I have tried not to disturb the final presentation copy. The text also in its rewritten form had to be kept untouched. The date of the author is as usual a vexed problem without any clue to its chronological position. 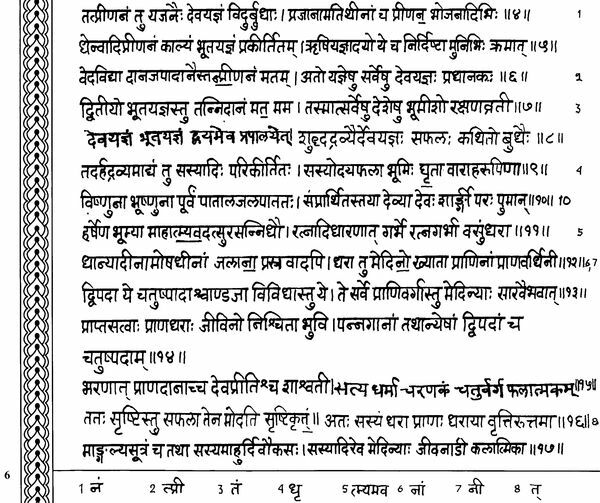 The title suggests, however, that the author belonged to the school of Kashyapa (a hoary antiquity), and reminds Manu’s disciple Bhrgu, who wrote the famous Smriti in his name and on his behalf. The simplicity of the author’s style is as deceptive as Valmiki’s Ramayana. 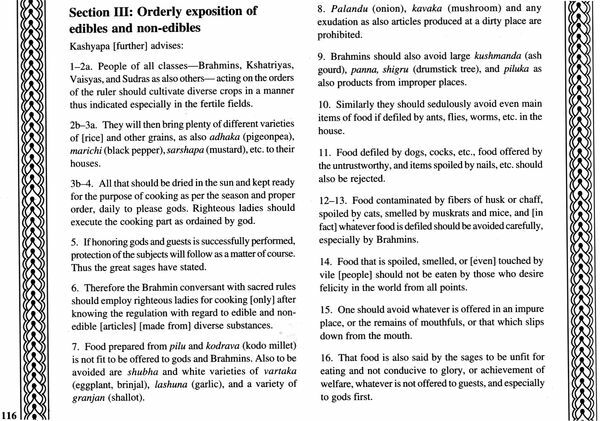 References to a few writers on cookery are hardly helpful to us in our present knowledge of the ancient works. I therefore refrain from any remarks. The question can best be left to personal conjecture. Though this question seems beyond settlement, the text is undoubtedly interesting for its bold views on a number of topics, and for its informative data. Apart from regular agricultural subjects, the author touches town planning, state responsibilities, marketing business, cooking, diet and nutrition, social thinking, and hints for legislation. Even communistic trends are no bar to this writer. There is ample scope for further research in this field. The varieties of crops vis-à-vis extensive synonymy are a problem. If every single term is presumed to he non- convertible, it can he ventured that all the names express, or at least represent, so many varieties. Questions arising from this assumption are many, and the solutions disputable. To take just one haphazard instance of common occurrence, rasala stands not only for mango, but also signifies olibanum (Boswellia spp. ), breadfruit, wheat, and sugarcane in different periods of history, which we are unable to specify, or at least infer, for want of means to ascertain. Problems of textual, critical, and linguistic nature form an independent subject for investigation. Though attempts have been made in this direction, the vast material available in Sanskrit is yet to he primarily sorted out for examination. 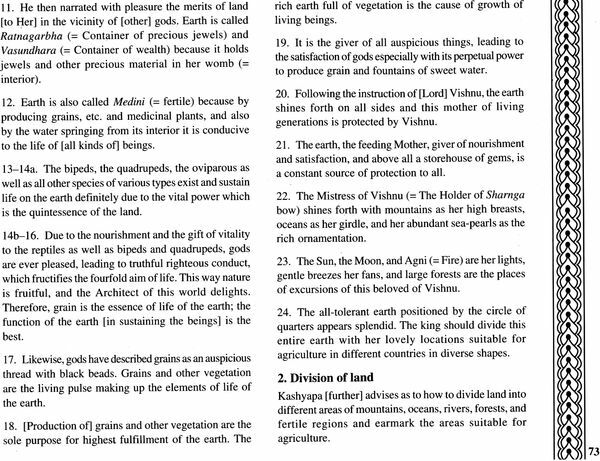 Unless the researcher has a good knowledge of the structure of the Sanskrit language and learning, such scientific projects of serious contention are hard to get through. Team work is necessary. So far as this text is concerned, I hope the translated text in English is more than tentative. Despite a few difficulties in getting at the purport, I take it that the text as we have it is mostly free from doubts. Sanskritists are invited to come forward for collaboration in further studies. Finally, I again offer my profuse thanks to all those who have actively participated in this venture, and to AAHF authorities for undertaking such useful work of academic nature with so much vigor and tenacity.